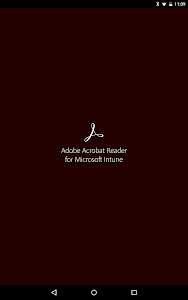 Adobe Acrobat Reader for Microsoft Intune is for opening, viewing and working with PDFs in a Microsoft Intune managed environment. 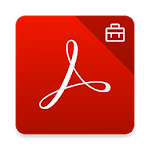 If you are looking for the consumer version of Acrobat Reader, download it here: https://play.google.com/store/apps/details?id=com.adobe.reader. 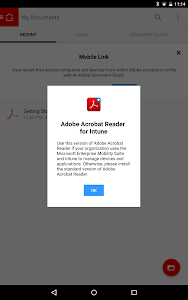 Adobe Acrobat for Intune gives enterprise users all the features they expect from Acrobat Reader, while providing IT administrators expanded mobile app management capabilities. 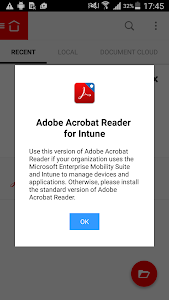 This app allows PDF data to reside in an encrypted container on the mobile device and work with other apps in the Intune ecosystem. 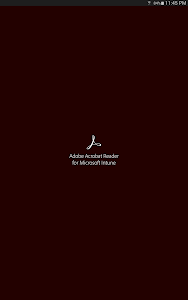 Additional policies can be applied to help prevent leakage of company information. 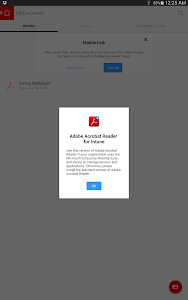 And in the event of a lost or stolen device IT can remove Acrobat Reader, along with any sensitive data associated with it. 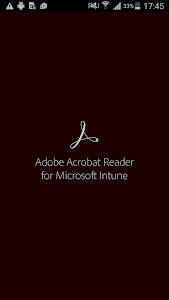 Similar to "Acrobat Reader for Intune"